Lovechild Photo returns to MAM with mini portrait sessions for your little ones in a studio environment! Lovechild is an authentic, true to kid, modern pop-up studio designed to capture kids at their best: as themselves. Our photographers encourage your child to be free: whimsical, loud, quiet, cool, bright and all that encapsulates who they are through expression and individual style in a studio setting. We love them that way, the way they just are, the way you do. Lovechild is a pop-up studio, holding events at various times and locations throughout the Los Angeles area and beyond. Come once a year, come to every event – we appreciate how quickly kids grow and change. Our quick sessions make it fun and easy to celebrate those memories along with every stage of their developing personalities. Walk-ins welcome, no reservation required! Select a plant from SANSO's rare flowering and desert plant collections and pair with your choice of round or cylinder SANSO ceramic planter in available colors, along with a water saucer to mix and match. *Note: Please know that stock selections on plants and ceramics (e.g. colors, sizes) will available on a first come, first serve basis during this event. This collection is exclusively curated and only available for pick-up during The 'Modern Artisan Marketplace' event held at The Platform (Culver City, Los Angeles) on Saturday March 24 & Sunday March 25 from 10 am to 5 pm. This is a FREE potting 101 workshop - with the purchase of a potted plant set. Spaces are limited, so sign up quick! 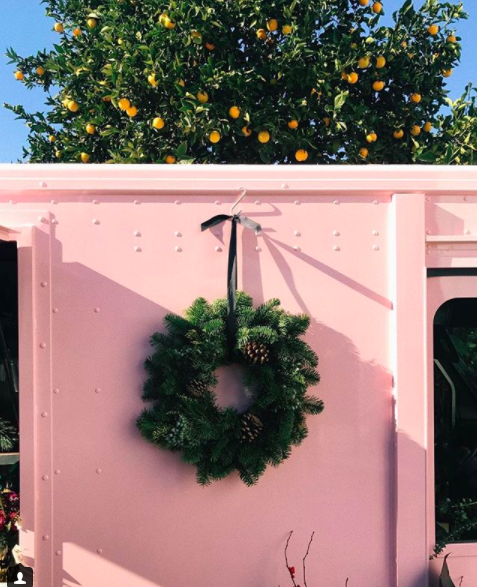 We are so excited to host mini photo sessions by Max Wanger at our ROW DTLA holiday pop-up! Max constructed his first camera out of paper and scotch tape when he was seven years old. To this day, he is fond of simplicity and negative space, to less is more, to the beauty in the unexpected. Max's photographs have been exhibited and recognized all over the world. Join local artist Gina Zycher for a hand building workshop as part of Modern Artisan Marketplace at ROW DTLA. You will learn basic to intermediate hand building techniques to make your own tea-cup and saucer or tumbler and spoon. Gina is a ceramic artist based in Los Angeles. She will glaze and fire your finished pieces and have them ready for pick up in 2 - 3 weeks. We look forward to meeting you at Still Life Ceramics! Workshop sessions are 2 hours. Stop by Lenita by Grita Flower Truck to get all of your holiday trees, wreaths, and floral needs! No sign up required. Erin Smith converted an old delivery van into a caravan to bring Tarot to the people. Come see her to get a reading done! No sign up required. Come celebrate the holidays with Flower Firm LA. Check out their beautiful floral bar and get inspired! No sign up required. 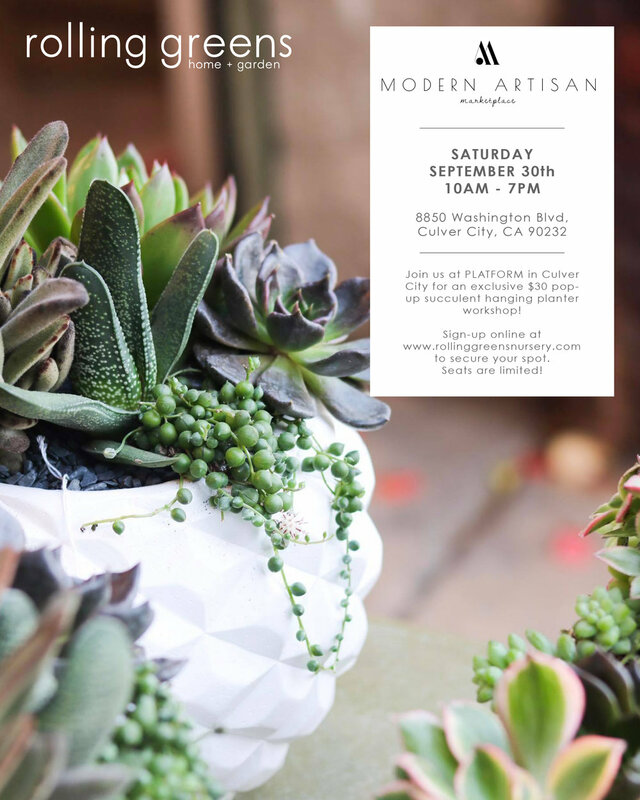 Join us for a pop-up succulent hanging planter workshop hosted by Rolling Greens on Saturday, September 30th! Rolling Greens is Southern California’s premier destination for unique home + garden. With locations in Los Angeles and Culver City their retail stores feature the finest live and artificial plants, home decor, containers, antiques and one-of-a-kind accents. They are continuously curating a lifestyle outside creative bounds. Workshop Includes: Hanging Planter, Three 2" succulents, special soil mix, one-on-one instructions and decorative toppers! Bring your kids and join us for a super fun kids yoga class each day! Coconut Yoga is a children’s yoga company that offers playful, nurturing and creative private, group and monthly workshops in NYC and LA. Classes are filled with imaginative yoga adventures, animated poses and mindful breathing techniques to keep young minds, bodies and hearts centered. Founded by Amanda Chase, who dreamed of bringing the calming, balancing and relaxing essence of being by the sea to children on a yoga mat. Makers Mess is a place for people to make messes or masterpieces while discovering and perfecting their artistic talents. It is a Silver Lake based art studio that offers art and design classes for kids and adults, and hosts rad events! DIY Confetti Bar -- create your own custom mix of confetti to bring home in special confetti tubes! Felt Animal Ears -- make your own felt animal ears for Fall! Pom Pom Wall Hangings -- colorful pom poms + birch brances turn into darling wall hangings! Ever wondered how to make that effortlessly chic brush lettering style that you've seen in modern shops everywhere? Spend an hour learning the basics, experimenting, unleashing your creativity and HAVING A FRIGGIN' BLAST with Shinah of Crooked Calligraphy! In this one hour mini-workshop, you'll learn what tools to use and how to manipulate a brush pen to create that casual cool look. You'll start with some warn-up strokes, learn two different alphabets, and finally, rock out your own awesome style! Each student will walk away with a final project that you can frame at home to add some modern chic to your space. Mini 15 minute portrait sessions for your little ones in a studio environment! This Saturday afternoon join Grace Gulley (of Lark + Arrow) for an afternoon of macrame. Learn the foundational skills needed to create your own hand-knotted pieces. There will be two classes taught. Join us for the earlier session and learn to make macrame plant hangers. You will leave with your own piece and the skills to make more at home! The later session we will be making macrame wall hangings, and again everyone will leave with their own hanging. Or join for both! Join Seedling for a fun afternoon of crafting and shopping! Here at Seedling, we are determined to create beautiful products that redefine how we shape and understand children’s creative time. We design nourishing play experiences that value process, and encourage experimentation, decision-making, and social interaction. Loved by children and trusted by parents, our award-winning products are specifically designed to help families put the child in control of the experience, and to encourage them to create their own adventure. After all visionaries aren’t born, they’re nurtured! 1. Visit TOM DIXON THE SHOP and take a photo (or gif!) using HASHTAG PHOTOBOOTH's mobile camera and studio backdrop. Your photos will be sent directly to your phone! 2. Upload your photo (or gif!) to Instagram and tag: @modern.artisan.marketplace @tomdixonstudio #MAMxTOMDIXON for a chance to win! 3. The winner will be announced on our Instagram on Sunday 3/12 at 6PM. Good luck!